Award-winning director Kim Ki-duk has built up an international reputation with his films that starkly differ from other mainstream movies in Korea and elsewhere. He stands out largely because he never veers off from his obsessive pursuit of provocative styles and thought-provoking themes. For better or worse, Kim did not pull any punches in making his 15th feature, "Dream" (Bi-Mong) dvd , to be released on Dec.19 2008. 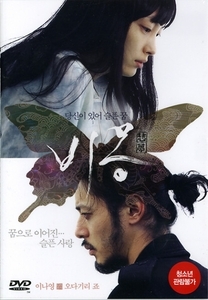 The movie was drawing keen media attention by signing on high-profile actors -- Lee Na-young from Korea and Joe Odagiri Japan -- but viewers should be aware of the cinematic puzzles director Kim routinely inserts in his films in order to grasp what is really going on in this mixture of reality and fantasy. In the film, Odagiri plays Jin, an artist who sees himself causing a car crash in his dream. What he discovers, however, is that his dream is not a mere creation of his brain because all the details he witnessed while sleeping turns out to be true in the reality. Or that's what viewers are supposed to assume, given the quirky plot turns provided by director Kim who never shies away from purposeful ambiguity and ambivalence. Jin encounters a woman named Ran (Lee Na-young), a character who has plenty of grievances about her own life, especially concerning the shattered relationships with her former boyfriend. Strange as it may be, what Jin believes he has done in his dream is what Ran has done in reality. Although the car accident happens in Jin's dream, the same incident plays out real in Ran's life, with police suspecting her as the prime suspect in the case. The key proposition of the movie is that the two main characters are connected through dreams in a way that blurs the boundary between reality and fantasy. And a butterfly emerges as the core image symbolizing the significance of dreams. In fact, this metaphor comes from a well-known ancient Chinese thinker, and its implication is rather straightforward: A person may dream about his life and discovers that it's just a dream when he wakes up, but how can he be sure about the possibility that what seems the reality is also another dream? Jin wakes up from a nightmare of a traffic accident. It drives him to the very spot where a real accident took place. He follows the police to the suspect's home and watches as Ran denies the hit-and-run accusation since she was asleep the entire night. Jin explains his dream to them and asks to be charged instead. The police dismiss him and arrest Ran. Jin is convinced that there's an unexplainable connection between the two. They discover that when he dreams, she acts out his dream in her sleep.